Although days of the week seem to get “blackened” more often than a salmon fillet during shopping season, it definitely was a Black Tuesday for Brendan Gaughan, the longtime NASCAR driver from Las Vegas not named Busch. 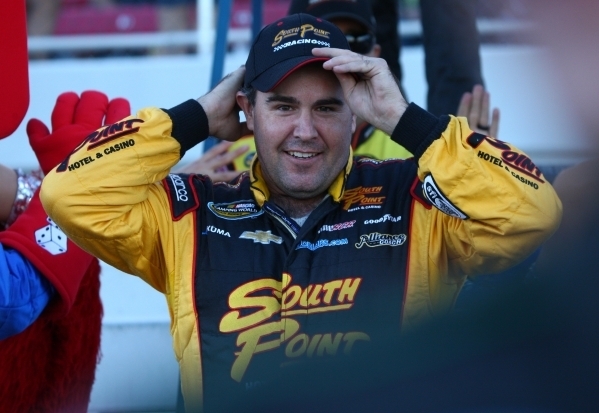 Gaughan turned 40 during the most recent auto racing season, but that had nothing to do with it. Tuesday was the day Georgetown lost to Creighton in basketball, 79-66. Long before he turned 40, Gaughan sat on the end of John Thompson’s bench, next to where the nuns sometimes sit. But he usually got to play against teams such as St. Leo. He also was a good kicker of extra points for the Georgetown football team, making 39 of 40. Creighton is the school his father and South Point owner, Michael Gaughan, attended. “The Gaughan Bowl,” Brendan said of Tuesday’s game. The next time father and son meet at Brendan’s Irish Pub, I have a feeling son will be picking up the tab. Also on Tuesday, it was announced that Kentucky Speedway will be repaved and reconfigured. Kentucky Speedway is/was Brendan Gaughan’s favorite track, other than the big oval at Las Vegas Motor Speedway. In 2014, he won an Xfinity Series race in Kentucky; he said his best-average finishing position over the years is at Kentucky Speedway. The banking in Turns 1 and 2 at the 1.5-mile Kentucky oval will be increased from 14 degrees to 17. Turns 3 and 4 will remain at 14 degrees. So the track will become asymmetric and the bumps for which it is known will disappear. Gaughan, who again will run a full Xfinity campaign in 2106 for car owner Richard Childress, liked the bumps. Bumps and an old racing surface that is tough on tires puts the driver back into the equation, he said. When old surfaces are paved over, it usually takes several years for the bumps to return or new racing grooves to emerge. But at the end of the day, he still seemed more upset by the Hoyas losing to Creighton by double digits. • BIG ONES AT LVMS — With the New Year’s Six bowl games having faded into blowout oblivion, it’s time again to circle key dates on Las Vegas Motor Speedway’s 2016 calendar. A Goodyear tire test for selected NASCAR Sprint Cup leadfoots is set for next week. But that one is sort of hush-hush — i.e., closed to the public. The major speedfest known as NASCAR Weekend begins March 4. That’s only two months from today. That’s not a lot of time to dig into your sofa cushions for pit pass money and to learn the new paint schemes and driver assignments. — NHRA Silver State Nationals, April 1-3. — NASCAR Camping World Truck Series Rhino Linings 350, Oct 1. — Red Bull Air Race World Championship, Oct. 15-16. — NHRA Toyota Nationals, Oct. 27-30. You also may want to circle July 2. That’s the annual Night of Fire, a motorized homage to the Fourth of July featuring flames and mayhem and cheap beer and … roll the timpani, please … waterless boat races. And don’t forget the rest of the Bullring season, which starts March 17. • EIGHTEEN MORE REASONS TO GO — Local fans and curious onlookers can receive $18 off NASCAR Weekend tickets through Jan. 18 by calling 644-4444. Eighteen is Kyle Busch’s car number, and Busch is from Las Vegas, and he’s your Sprint Cup champion. And that’s why you can get a nice discount on race tickets with proof of Nevada residency. This is probably where you wish Michael McDowell were from Las Vegas and that he was your reigning Sprint Cup champion. McDowell will drive car No. 95 in 2016, and $95 off NASCAR tickets would be an even better discount. • SCHMIDT HAPPENS ONLINE — Quadriplegic Indycar team owner Sam Schmidt of Lake Las Vegas finished 16th among a field of 25 pros in the fifth iRacing.com Pro Race of Champions on Dec. 17. Schmidt was involved in an early crash but rallied to post a decent finish in the annual online race that featured notables such as NASCAR’s Brad Keselowski and NHRA’s Ron Capps. Schmidt competed by using a specially equipped motion simulator and sensors that enabled him to drive a real-life Corvette at Indianapolis Motor Speedway. “We’ve been working on this project with the Corvette for a couple of years, but to be in a simulated race format and not have to pay the repair bill is twice as fun,” said Schmidt, who drove in three Indy 500s before being injured in a testing crash at Walt Disney World Speedway in January 2000. • GREEN-WHITE-CHECKER — After winning the 1957 Indianapolis 500, veteran driver Sam Hanks pulled into Victory Lane, removed his grease-stained goggles and said “I quit.” Hanks figured it couldn’t get any better than winning the famous 500-mile race, so he retired on the spot. So before moving on to 2016, it’s worth looking back to a sultry summer night in 2015 when a man from upstate New York named Leon Gonyo trumped Sam Hanks in a most tragic, bittersweet fashion. Leon Gonyo was 63, and wearing a helmet and seatbelt when he died. Which is how most racers would want it.